The Territorial Planning Commission, Economic Advisory Commission, Workforce Development Commission, Board of Higher Education, and the recently announced Task Force charged with creating an Economic Development Implementation Plan, are all examples of partnerships between public and private sector leaders committed to a healthy, prosperous, and sustainable American Samoa. The NEG Program's lessons and recommendations contain information important to all of them. The American Samoa Government website offer access to many offices and agencies affiliated with all three branches of the American Samoa Government, with a few exceptions, such as the American Samoa Department of Education and the Department of Human and Social Services. The American Samoa Department of Human Resources, the personnel arm of the American Samoa Government, is the agency responsible for the National Emergency Grant and the catalyst for this project. One of the key government agencies concerned with talent and economic prosperity in the territory. The Department also support the Territorial Planning Commission - the body charged with oversight of the Comprehensive Economic Development Study (CEDS) currently undergoing public review. 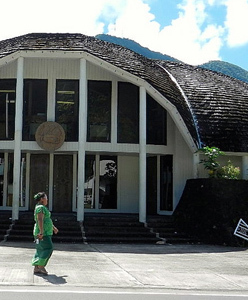 The only institution of higher education and training on the island, American Samoa Community College serves about 2,000 part-time and full-time students. Launched in July, American Samoa's new Career One-Stop Center provides a range of job-seker and employer services and enables collaboration among existing workforce programs, including those designed for veterans. Importantly, by its very existence – and and location along the main boulevard in Tutuila's most popluated village – the center communicates the importance of job and career planning and professional development in the economic recovery of the island. It was initially funded by the National Emergency Grant. Established with the help of the National Emergency Grant, the American Samoa Culinary Academy offers introductory training in food preparation and safety as well as sector-specific job search assistance. It is in the process of attaining American Culinary Federation accrediation and building intermediate and advanced curricula in service of an eventual accredited degree program. The Academy also hosts a student-run bistro and catering service that generate revenue to support the program. It is one of the initiatives profiled in the From Tsunami to Renewal report and documentary video. In recent years, the American Samoa Vistors Bureau has worked to increase the visibility of the island in an effort increase tourism and development opportunities, launching this new website last year and producing the island's first official tourism brochure in January 2012. The American Recovery and Reinvestment Act authorized stimulus spending in American Samoa in early 2009. The ASESRO site provides information about the scope and nature of thise investments, which occured both before and after the 2009 tsunami. American Samoa National Park opened in 1988 and is the only US National Park south of the equator. The National Park Service in American Samoa participated in the NEG program and was one of the sites documented in the From Tsunami to Renewal project report and documentary video. This site provides more information about the park and its management and operations. The Center for Micronesian Empowerment collaborated with American Samoa NEG leaders to design the construction trades training program for American Samoans in Guam, one of the initiatives proviled in the From Tsunami to Renewal project report and documentary video. The The Guam Contractors Association Construction Trades Academy managed the construction trades training program for American Samoa NEG participants on Guam, one of three initiatives profiled in the From Tsunami to Reneweal project report and documentary video. The US Department of Labor's National Emergency Grant Program offers communities support for transitioning workers after mass layoffs or dislocations arising. This site offers information about the program generally and the NEG Disaster Grant Program which is the one operating in American Samoa. In Feburary 2012, the US Department of Interior Office (DOI) of Insular Affairs hosted a convening of the Interagency group on Insular Areas. Presentations and briefing papers shared during this event are archived on the DOI websites. The American Samoa Tsunami Study was commissioned in 2011. Final report and other project documentation are available on the project's website. The program review at the center of the From Tsunami to Renewal project contains a series of lessons as well as recommendations for making the most of American Samoa's NEG experience. The NEG program focused on jobs (phase I) and workforce development (phase II), but these issues are not the purview of workforce development professionals alone. The questions raised through the project - about how young people transition to jobs, how adults continue to learn new skills, how workers transition from job to job in ways that help them build financial stability and rewarding careers or launch job-creating businesses of their own - are of concern to many government agencies, the legislature, firms and business asociations, non-profit organizations, and people and families in every village in the territory. All of them are stakeholders. On this page, we list the stakeholders we expect to most benefit from the lessons and innovations that resulted from American Samoa's NEG Program, and use them to inform, advance, or shape the enxt generation of economic and workforce development, education, and prosperity strategies in the territory. Click Here to check out these photos from the NEG Program Review, American Samoa.